No more asking a stranger to take your picture. You can take photos with family, friends or colleague at any time you want. Built-in Bluetooth shutter, it connects quickly, has the range and angle that you desire to have for a great photo shot. Taking selfies is much easier and has more fun than ever before! Made with premium ABS+PC tripod stand and durable aluminum alloy extendable body, this selife stick is light yet strong. The adiabatic phone holder covered by soft silicone interior is to protect your precious phone from scratching, and tripod leg also has added anti-slip rubber support for extra stability. Portable pocket size design, it folds and collapses to fit in a purse or pocket; Internal 65mAh rechargeable battery supports capturing up to 50000 selfies after full charge within 30-45 minutes. An essential item to take on your holidays or days out. 1.Remote only supports smartphones, it can't control action camera. 2.Other GoPro accessories and Charging Cable are not included in the package. 【Ingenious 2-in-1 design】This not only functions as a selfie stick, but also a tripod stand! The tripod feature helps to liberate your hands, and gives excellent stability to videos/pictures. Easy for you to record video or facetime with your friends. A perfect way to turn your phone/gopro into the perfect camera, and take your filming to next level. 【Wireless Remote Shutter】Stable tripod with built-in removable Bluetooth remote allows you to take a bunch of different angles and snap from long distances. Instantly connect your phone and begin taking selfies freely. Gone are the days of having to ask a stranger to take photos for you. You can get everybody in the photo when taking group pics. 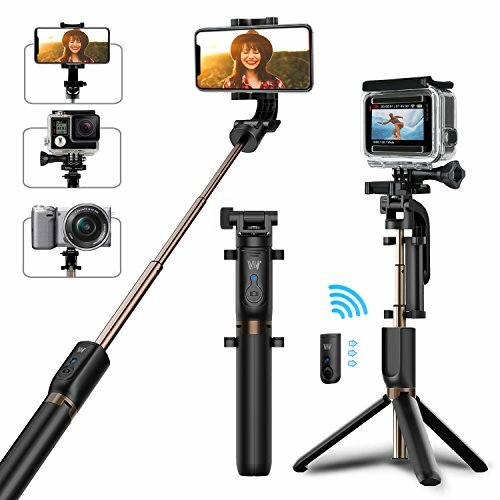 【Extendable & Portable & Adjustable】7.87'' folded size & up to 28.74'' extension length, 5.47oz weight, lightweight and compact for you to take it anywhere; 3 ways to rotate the selfie stick, 225° rotation clamp with adjustable knob + 360° rotatable phone holder + 360° rotation head, ensuring that you can capture a best & beautiful angle when taking selfies. 【Meet Your Various Meets】It's an ideal gadget for your family gatherings, nights out, hiking trip, holidays, graduation, travel, party, live broadcasting, etc. Solid construction, super elegant and profesh-looking, it will be an ideal gift for your friends or families who love taking pictures, capturing memories for life. 【Wide Compatibility & Risk-free Purchase】Universal cell phone holder & action camera tripod, compatible with iPhone X/8 Plus/8/7 Plus/7/6S Plus/6S, Galaxy S9/S9 Plus/S8/S8 Plus/S7 Edge/J7, Google Pixel, GoPro, Yi and other action cameras. You will not only get this selfie stand you ever need, but also 30-Days Money Back Guarantee, worry-free 12-Month Warranty and our Friendly Customer Service. If you have any questions about this product by Matone, contact us by completing and submitting the form below. If you are looking for a specif part number, please include it with your message.